Immortal Romance - Play Instantly For Free! Game Information: Immortal Romance is probably one of the most popular online pokies from Microgaming. This tragic love story offers players a journey to the dark and gothic world of vampires, complete with expertly designed graphics and a dark and broody soundtrack to set the tone, while a variety of bonus features puts you in the winning mood. Immortal Romance tells the tale of star-crossed lovers on five reels, and as you spin, you will learn more about the characters and hopefully land some lucrative wins. 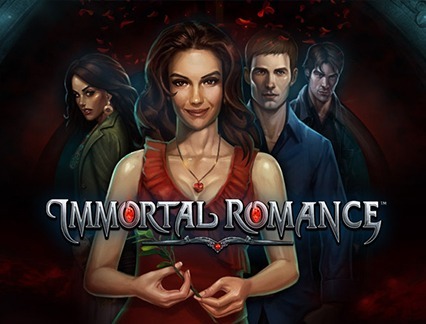 Immortal Romance is one of Microgaming’s top online pokies and is available to play or free or for real money. Immortal Romance offers five reels and 243 ways to win. This means that there are no fixed paylines and symbol combinations pay from left to right. The vampire theme is perfectly represented by the symbols available, which include higher value symbols like the four characters from the game, namely Michael, Sarah, Amber and Troy, as well as a manuscript and old house. The wild symbol is the game logo and the scatter is represented by the lion’s head door knocker. Start the game by selecting your bet size by using the + and – signs to select your bet denomination. The games uses 243 ways, therefore you will not have to choose any paylines. Click ‘Coins’ to adjust the number of coins you wish to wager and ‘Spin’ once you are ready to get the reels spinning. As the reels are in motions, various symbols will appear on screen, including the main characters. You must match the symbols from left to right to win the amounts shown on the paytable. The wild symbol acts as a substitute and replaces all symbols on the reels except the scatter. There is also a Wild Desire feature, which can be triggered at any point and awards some great wins. When this feature is activated, the reels will randomly turn wild, and there is even the opportunity to turn all five reels wild, which will award a remarkable payout. The game features a gloomy yet inspiring look and feel that will really take you to the heart of the action. The vampire/love story featured in the game offers a thrilling combination of romance and danger, which is highlighted by the dark visuals and captivating soundtrack. 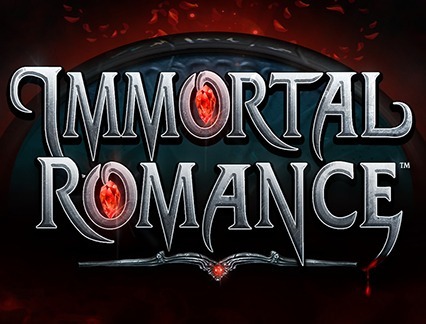 Immortal Romance offers the same exhilarating gameplay as fellow Microgaming title Thunderstruck II, although here you can expect better features and greater payouts. The Wild Desire feature takes things up a notch in terms of wins, while the bonus round can be highly rewarding thanks to the Rolling Reels feature with a 5x multiplier. Immortal Romance is a medium-high variance pokie. Immortal Romance features a lucrative bonus game called the Chamber of Spins. To trigger this feature, you must land three, four, or five lion’s head scatter symbols. When you trigger the bonus for the first time you can only pick the Amber option, but trigger 5, 10 or 15 respectively and you can pick Michael, Troy and Sarah. Amber – Receive 10 free spins with a 5x multiplier. Troy – Receive 15 free spins with vampire bats that randomly swarm over the reels, and transforming them into 2x or 3x multipliers. Michael – Receive 20 free spins with Rolling Reels. Every time you land a winning spin, the symbols involved will change into other symbols. Every time a winning combination is formed, the multiplier increases by 1x up to 5x. Sarah – Receive 25 free spins. Landing a Wild Vine symbol on the third reel will also transform random symbols into wilds. Land 2, 3, 4 or 5 scatters for 1, 2, 3, or 4 free spins respectively.